Great show but how come some episodes do not download. Angry video game nerd should have a podcast too. Well, retro gaming is awesome, and so is this podcast!!! these guys put the fun in funny!! you don't want to miss a single episode of this podcast!! they will keep you laughing for hours!!! if you don't watch these, its your loss!! I love their show it is soo awesome! It's very worth watching! I think these dudes are awesome and nes is totally sweet. They need to put up the rest of the episodes!!! Worst. Podcast. Ever. Childish, stupid, just terrible. Hey I am not so young to not appreciate this I have been with these systems my whole life, This is sooo funny on so many levels! It reminds of my Dad or Mom trying to play the N64, Geez it was like learning a foreign language. I love love and apreciate this show! Definetly a funny series. I would advise anyone who is a fan of retro games(or even games in general) to at least give this a shot. This show is excellent and I can't get enough, keep the episodes coming...Do the R.O.B. They have really great stuff and I would simply advise everyone to check them out! I love this podcast. It is about two brothers, Ace and Chet, and their love for video games. However, they play their "new" Nintendo Entertainment System. Watch and laugh as Ace and Chet play their favorite games! ... that it might just be the most hilarious podcast out there. Like someone said before, perfect for retro gamers with a sense of humor. It's surprisingly well produced, with a cool intro and nifty editing. These guys need some shorts on G4 or somewhere else. And as previously stated, it's downright hilarious (in that stupid guilty pleasure of "WOAH! EXTREME!" humor). Keep up the great work! More! We must have more! Their indisputable detachment from reality makes this the funniest game-fanatics podcast on the planet. These guys have a misdirected passion for vintage games, which makes the show an immediate hit with retro gamers. (You can't help but encourage someone to root for neglected classics, such as Super Mario Bros. and Duck Hunt.) The music and camera work makes me feel like I'm watching MTV... Enormous energy - sometimes the hosts seem exhausted from shouting "Wooo!" after every sentence. The music alone is enough to make you dig up your old Nintendo box. A carefree fun podcast that gets four stars from moi. 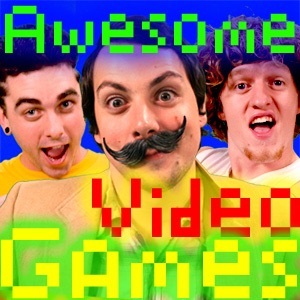 Awesome Video Games! Video Games are Awesome! Do do dooo do do! This is great, though if you are photosensitive, please do not view. This is halarious! Great for any retro gamer.